Whatever Mattie Kenny goes on to achieve with Dublin, he is unlikely to recall his first League match as an inter-county manager with any great warmth. A significantly improved second half performance in Parnell Park tonight helped Dublin to beat Carlow by six points, thus sparing Kenny the sort of opening night his predecessor Pat Gilroy suffered at the hands of Offaly in Croke Park last year. Mitigation for the performance was everywhere, however. It fell from the sky. 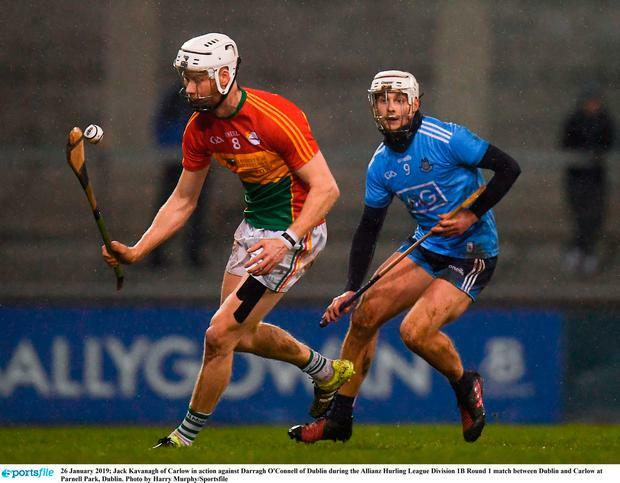 Under incessant January rain that subsided somewhat around half-time, the pitch in Parnell Park cut up badly and the ability to simply maintain balance was priceless. By the end, the pitch resembled a camp site on the last day of a music festival. Miscontrolled pick-ups and drop balls outnumbered the successful execution of either basic skill by multiples. But an early second-half spurt and a pronounced, game-winning impact from their bench gave Dublin two Division 1B points. Early on, John Hetherton dominated the skies on his full League debut and he was central to the first significant score of the game when he fed Eamonn Dillon, off whose hurley the sliotar bounced to the onrushing Darragh O’Connell. In his first inter-county action since April 2017, the Cuala midfielder slammed a goal past Brian Tracey to set a positive early tone for the home side. Thereafter, Carlow were the better team until half-time arrived and with it, some respite from the elements. Easily the most powerful performance of the half was that of Carlow centre-forward, Marty Kavanagh. On a sloppy, sodden night for freetaking, Kavanagh struck his impeccably and added a couple of excellent points from play to the mix. He finished with 0-12 (3f). And Carlow led by two at half-time, impressively scoring 0-11 from 11 scoring chances. Dublin hit six wides in that period and struggled to generate any attacking spark other than Hetherton’s physical presence and Dillon’s occasional burst. At half-time, Donal Burke – one of six Dublin players to play for DCU in the Fitzgibbon Cup against CIT on Thursday – was added to the mix and the Na Fianna forward finished with 1-4, all from play. Similarly, Danny Sutcliffe made his seasonal reappearance and his first three touches of 2019 were calm and creative by way of comparison to the frenzy unfolding around him. Burke started the Dublin fightback but Dillon scored their second crucial goal at the second attempt. And for all their fiery competitiveness, Carlow were indebted to their goalkeeper Brian Tracey, who repelled three close-range goal chances and also saved a John Hetherton shot from dropping over the bar. With Kavanagh better wrapped by Eoghan O’Donnell after moving to the edge of the Dublin square, Carlow found scores hard to come by. By contrast, Burke and Sutcliffe gave Dublin they impetus they required to secure an opening night victory. SCORERS – Dublin: D Burke 1-4, E Dillon 1-1, J Hetherton 0-4 (3f), D O’Connell 1-0, F McGibb 0-2, F Whitely, T Connolly, P Smyth, O O’Rorke (f) 0-1 each. Carlow: M Kavanagh 0-12 (9f), T Joyce, C Nolan 0-2 each, S Murphy, J Doyle 0-1 each.